The Real Estate market in Arizona is back and staying on top of your real estate license has never been more important. Our 24 hour Arizona Real Estate Package brings you the latest information and requirements so you can rest assured that you are being the best real estate agent that you can be. Grow your business and succeed in real estate. Our courses can help. This package is designed to meet your 24 credit hour license renewal requirement. Consensual Dual Agency - Dual agency, agency policy, procedures for implementing, documenting, and changing agency policy. ADA and Fair Housing - Refresh your knowledge of the Fair Housing Laws. 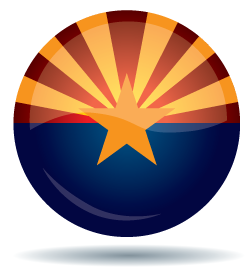 Arizona Commissioner's Standards - License law requirements related to compensation, disclosures, record keeping, and other activities of licensees. Commercial Sales and Exchanges - Commercial sales transaction and tax deferred exchanges. Disclosure of Environmental Hazards - Real estate standards, regulations, and legal principles relating to property disclosure. Sales Comparison Approach - This course covers the steps in the sales comparison approach to valuation. The course explains the data collection process and the methods for estimating adjustments. Students will apply what they learn using numerous examples. Completion of these courses satisfies all 24 credit hours of continuing education required for real estate agent license renewal in the state of Arizona. Commercial Leases - Office, retail, and industrial leases. Federal law and Commercial Real Estate - This course acquaints students with specific laws pertaining to commercial real estate ownership. Includes laws governing environmental issues, the Americans with Disabilities Act (ADA), and interstate land sales. Ethics in Real Estate - NAR Code of Ethics and case studies. This complete package includes all 24 hours of CE required for broker and sales license renewals. This package includes 18 mandatory CE hours required for broker and sales license renewals. This package includes 6 general CE hours required for broker and sales license renewals. This course covers license law requirements related to compensation, handling of client funds, disclosures, record keeping, and other activities of licensees. The course meets the three-hour Commissioner's Standards requirement for license renewal. Through this course, you will learn the nuts and bolts of Arizona real estate licensing, including details outlining license renewals, disclosure, and unlicensed activity. The course also discusses compensation and professional conduct, as well as broker supervision and controls. Finally, advertising is covered extensively as this is a topic of great interest to both licensees who actively market their services and the Commissioner. *This course counts as 3 mandatory hours in Commissioner's Standards in Arizona. This course meets 3 hours of Fair Housing credit. Each of us has had someone treat us unfairly due to a judgment they’ve made about us. Within your real estate business, it is crucial that you understand the principles of practicing fair housing so that you are able to run a fair and honest business. In this course, we will discuss the protections provided by the Fair Housing Act, the recourses provided by the Act, and how to protect your clients and your business from discrimination. This course counts as 3 mandatory hours in Fair Housing Issues in Arizona. This course describes agency relationships and the inherent conflicts of interest of each, followed by coverage of dual agency, agency policy and procedures for implementing, documenting and changing agency policy. This course meets 3 hours of Agency credit. The business of real estate hinges on the concept of agency, where real estate professionals represent the needs of buyers and/or sellers. Buyers and sellers may choose to act for themselves as customers or to enter into an agency agreement whereby the licensee/brokerage firm acts for them in the capacity of an agent. Agency means to act for another in a fiduciary manner. This course explores no representation, full representation, and dual agency with its limited representation. This course counts as 3 mandatory hours in Agency Law in Arizona. The course covers broad issues of real estate standards, regulations, and legal principles relating to property disclosure. Topics reviewed in detail include asbestos, lead, radon, mold, methamphetamine labs and other environmental hazards. This course meets 3 hours of Disclosure credit. Real estate transactions depend on the disclosure of information in order for buyers and sellers to make informed decisions. These disclosures are mandated by law to reveal all pertinent and relevant facts about the property, the principles, and the agents who represent them. Sellers and buyers have specific rights and responsibilities when it concerns material information about the property one owns or is about to purchase. This course will walk you through those disclosures and what is required of you, as a real estate professional, to ensure all disclosures are made according to the law. This course counts as 3 mandatory hours in Disclosures in Arizona. This course analyzes the typical provisions of office, retail, and industrial leases. Formulas used to calculate rent, key negotiation points, and technical issues unique to industrial leases are also covered in great detail. This course meets 6 hours of Contract Law credit. In Arizona, forms used by licensees are formatted similarly, making it easy to practice in communities where licensees have the opportunity to write a residential property contract one day and a vacant land contract or a commercial contract the next. The formatting of the forms assists licensees in transitioning quickly from one type of transaction to another when dealing with different types of properties. Whether you use forms produced by the Arizona Association of REALTORS® or other standard forms, contract law concepts prevail. This class will stress general concepts without giving up certain specificity required by specialists in both residential and vacant land. This course counts as 3 mandatory hours in Contract Law in Arizona. Short sales are rising in popularity as homeowners and lenders recognize their value in restoring the marketplace. Easier on credit scores, and often more profitable and less time-consuming for lenders, short sales are gaining market share across the country. They also come with more risk than standard transactions. To successfully obtain disclosures, protect clients, and avoid any hint of fraud or negligence, licensees must be fluent in all the local rules and processes. This 3-hour course was updated in 2012. The content is specific to Arizona, current, and applicable for licensees wanting more information about this growing market. It is estimated that approximately $300 billion in real estate is transacted by investors each year. Grab your piece of the pie by understanding the driving forces in the dynamic residential real estate investment market. Possessing knowledge of the strategies and mindsets of investors will help you serve your valuable investor clients effectively, responsibly, and ethically. Through this course, you will learn the impact of real estate investment in the United States, the opportunities that exist for investors, and your role in representing the residential real estate investor. This course counts as 3 mandatory hours in Legal Issues in Arizona. This course covers the steps in the sales comparison approach to valuation. The course explains the data collection process and the methods for estimating adjustments. Students will apply what they learn using numerous examples. This course satisfies 6 hours of General Real Estate credit. This course acquaints students with specific laws pertaining to commercial real estate ownership. Includes laws governing environmental issues, the Americans with Disabilities Act (ADA), and interstate land sales. The trend to “go green” now extends beyond weekly recycling efforts and the latest Hybrid cars. In fact, the effects of this movement are becoming increasingly visible in the real estate market. This means that it is crucial for you, as an industry professional, to have a thorough understanding of green home qualifications, eco-friendly remodeling possibilities, and energy-efficient technologies. This 3-hour course provides you with the information you need to successfully guide your more eco-minded clients. Whether you’re helping a buyer find a newly constructed green home or advising a seller on green remodeling efforts to improve a listing, you’ll be able to provide your clients with support they need. In residential real estate transactions, you are responsible for assisting clients in one of the largest purchases of their lives. Clients literally risk hundreds of thousands of dollars, or more, and they require your expertise to hold it all together. In addition, people invest not just their money in a real estate purchase; they invest their emotions and their family’s well-being in these transactions. When things go wrong, they look to you as the cause first. Because of this, it’s important for you to have a firm grasp on the concept of risk management and understand how to employ a variety of risk management strategies to protect yourself, your clients, and your business from unwanted hassles and costly missteps. Ethics in Real Estate covers the NAR Code of Ethics and reviews case studies pertaining to the code. Sample scenarios are included as a decision making practice for licensees. This course will insure that real estate professionals have a strong understanding of the National Association of Realtors (NAR) Code of Ethics and understand the difference between ethical and unethical behavior. The 6 General Real Estate hours may be in any of the above categories OR General Real Estate. Ariz. Admin. Code R4-28-402 (C) A person shall not receive credit for more than nine hours of continuing education classes per day.